I have been working on a line of stationary to begin selling. 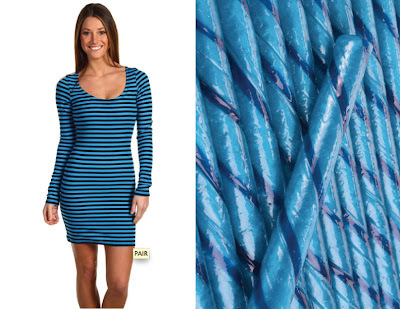 The line is vibrant, springy and super-sweet because it involves cupcakes and ice cream! Apparently I'm not the only designer having a massive sweet tooth right now. 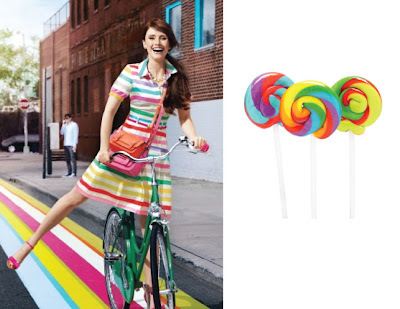 I found some very candy-striped spring duds (not Milk Duds unfortunately) at Anthropologie, Kate Spade and Betsey Johson. 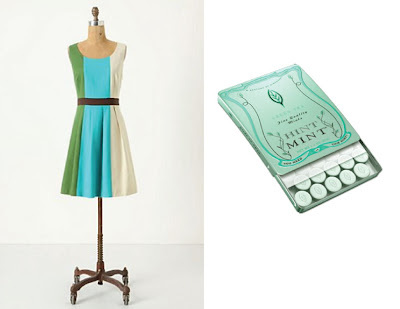 The days of deep warm colors are brightening up to springy vibrants and proving that this spring will be oh so sweet. The amazing dress above graces the homepage of Kate Spade and is perfect to bring us into spring, especially after all the cold and snow. I found this adorable blueberry colored dress by Betsey Johnson here. It sparked this post because it reminded me so much of the old-fashioned candy sticks! 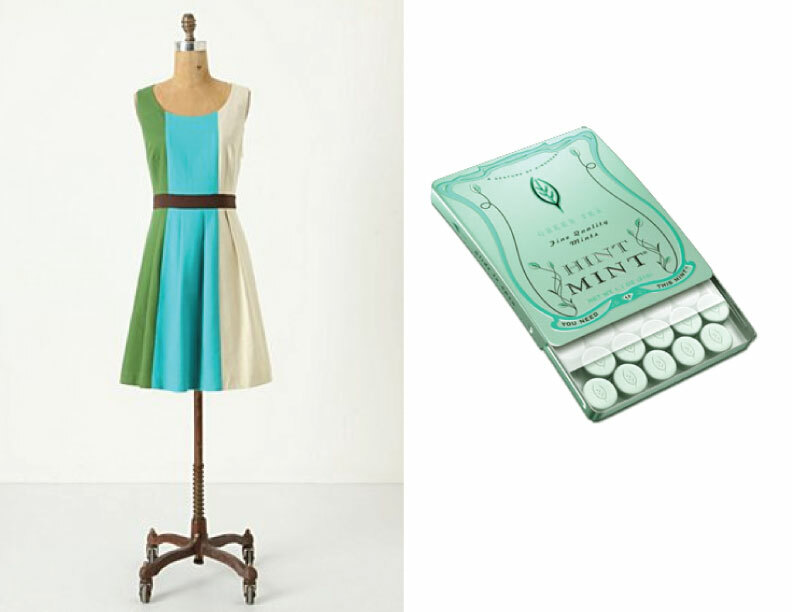 Anthropologie is always putting interesting color palettes together and this one is so springy and refreshing, just like this adorable box of mints. Sometimes there is a bit of leftover chill from winter during those in-between days. 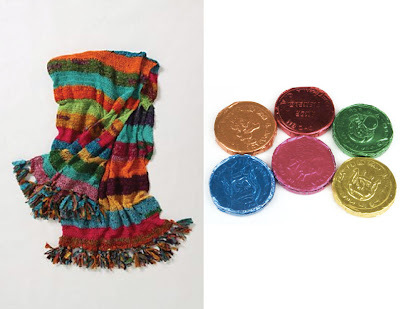 This beautiful Sari Throw will keep you warm while staying bright and cheery. The deep hues of these stripes are reminiscent of netted bags filled with these foiled chocolate coins. A good pair of socks will always keep your feet warm. 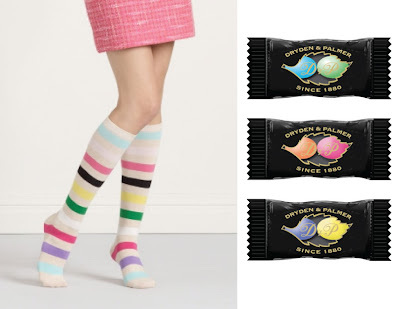 With these Kate Spade Candy Stripe Knee-Highs, every time you look down you will smile. The pop of the dark stripe boldens the rest of the candy-coated colors for a little something more. Much like biting into a colorful tiny chocolate candy. *A tip for themed parties (hint to brides who want a fun candy bar), all the candy images were from Candy Warehouse, where you can shop by color. They have an array of candies in many different colors for your guests to indulge in.